Two weekends ago, Tawn and I took a break in Singapore. It was a busy four days filled with seeing friends and eating. Singapore is well-known as a foodie’s paradise. Dinner the first night was with a group of Singaporean friends who took us to Number 3 Crab, an excellent seafood restaurant in the Tiong Bahru neighborhood. Tiong Bahru is one of the the oldest housing estates in Singapore and has been undergoing something of a gentrification in the past few years. It is becoming quite a hip and happening place thanks to its charming mix of vaguely art deco government flats and traditional Chinese chop houses, with residents ranging from local Singaporeans to expatriates from all corners of the globe. 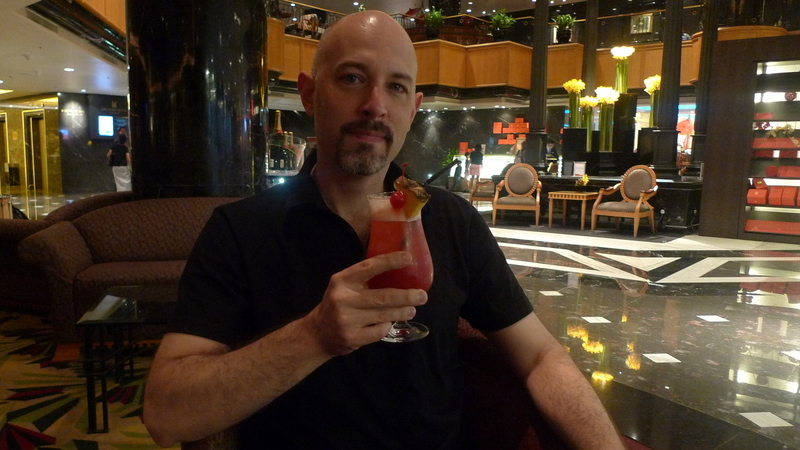 Having a drink (a Singapore Sling, of course) in the lobby of our hotel, the Millenium Orchard Hotel, located conveniently on the far end of Orchard Road, a short walk from the MRT station. Number 3 Crab has been acclaimed as one of Singapore’s finest restaurants and its owners, Thomas and Wendy Lim, have an edge on the competition: they are purveyors of seafood, not just restaurateurs, and own a fresh seafood stall at a local market. The menu, illustrated with large color photos, includes just about every type of seafood you could imagine, including crocodile paw, something we didn’t get around to sampling. In addition, they offer several meat dishes and a good selection of vegetables, so you can round out your dinner nicely. 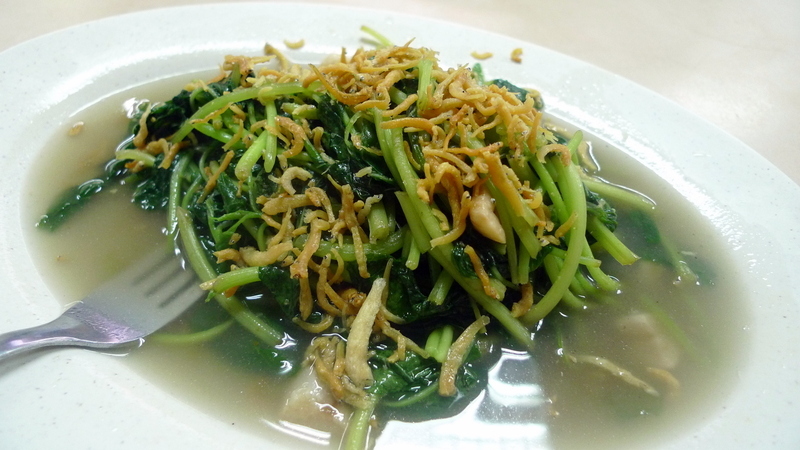 Stir fried greens – spinach, I think – in a light broth with fried silverfish on top. 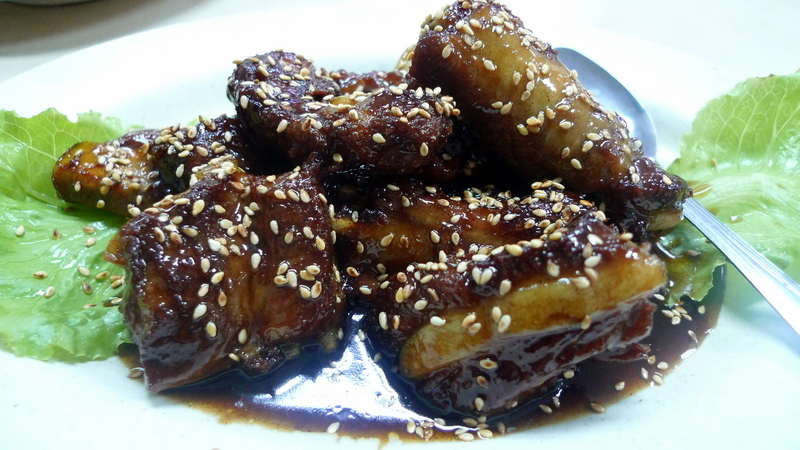 Pork spareribs in a sweet, sticky, and rich coffee glaze. These were so wonderful, I almost forgot that we were going to eat crab and gorged on the ribs! 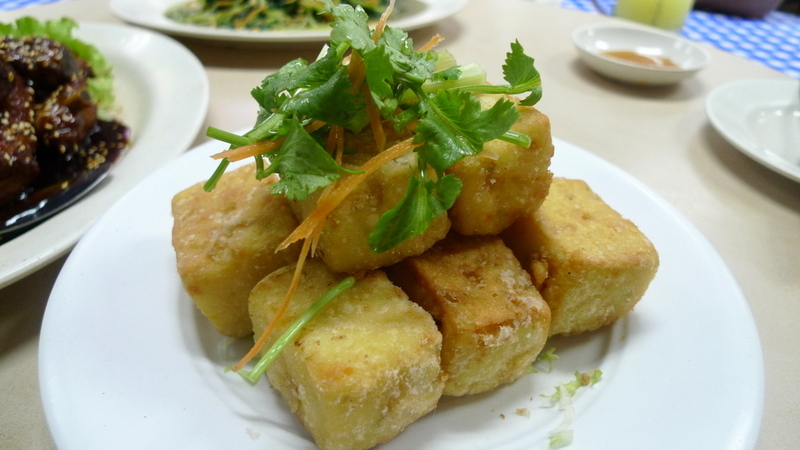 Crispy fried beancurd (tofu) which I think had chopped shrimp mixed into it. I may be wrong about that, though. In either case, it was tasty and the texture was a perfect contrast of crispy exterior and silken interior. 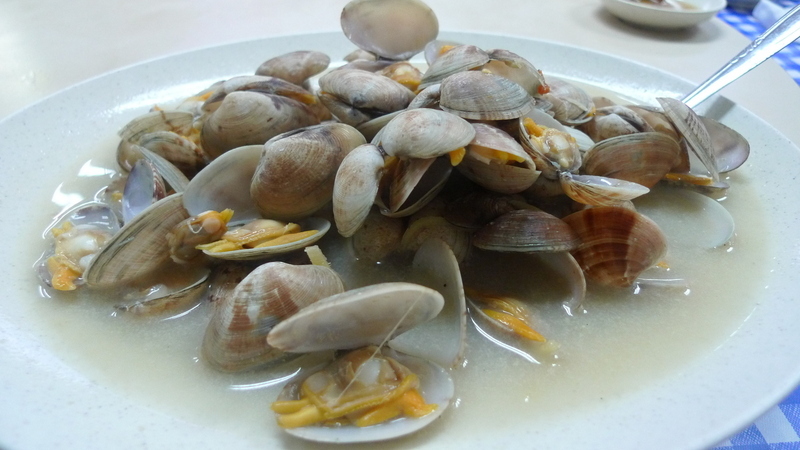 This is the clams with special sauce, which I think was enhanced with soy milk. I might be wrong about that, but it sure was tasty. 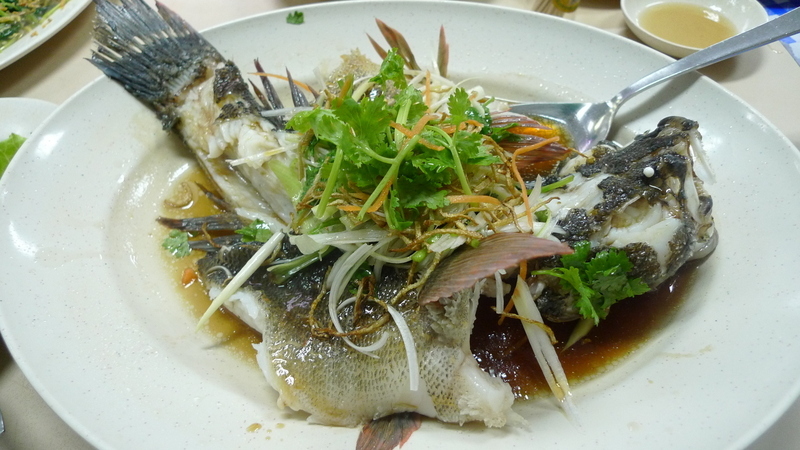 Hong Kong style steamed fish with a soy and oil sauce. This fish was really lovely, light, delicate, and perfectly cooked. 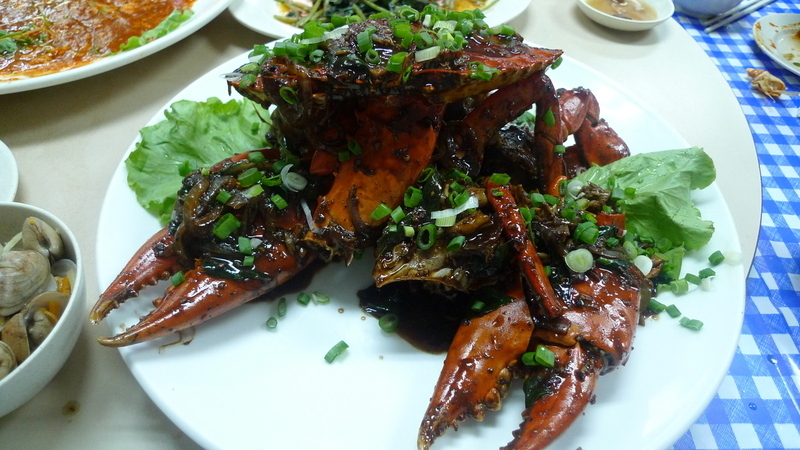 The first of our two crabs (serving seven of us) was prepared with a chili sauce. They give everyone a large plastic bib because there is no way to eat the crabs without making a mess of it. The sauce was nice, more sweet than spicy. The second crab came with a special pepper sauce, which I found even more enjoyable than the chili sauce. The pepper sauce has a more complex flavor, using different types of pepper to add depth. 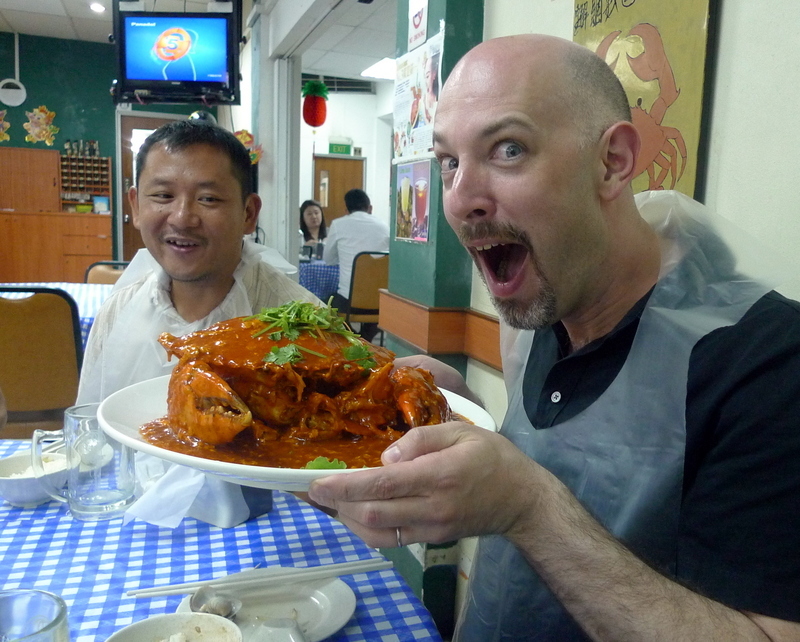 To get a sense of how large these crabs are, here’s me hoarding the first one. A lot of the time, I don’t see the point of messing around with crabs because they are too small to make the effort worthwhile. In this case, the crabs were huge and there was plenty of meat inside. The crabs were also very fresh, pulled from a tank kicking and screaming (well, kicking) and killed to order. This dinner was a good example of Singaporean food at its best: simple dishes prepared with tremendously fresh ingredients and cooked with great skill. As a sign on their wall puts it, their name may be “Number 3 Crab” but they are definitely number one. This entry was posted in Uncategorized and tagged 3Crab, Chili, Crab, Dining, food, Number3Crab, Pepper, Restaurant, Seafood, singapore by christao408. Bookmark the permalink. Mellben Seafood is pretty famous here. Next time try it. Here’s my rec.! Did you have to torture me this morning?! Now I want seafood at 7:00 a.m. I’m curious to know what type of crabs those were. That fish looks beautiul. I was going to get Mexican food today, but now Asian sounds better. The name of the restaurant would pull me into it. -love the pictures. I want to eat there! You didn’t order a single dish that I wouldn’t try… Now I’m salivating and have to contemplate my lunch choices. None of which include #3 Crab. Drat!! @PPhilip – Thanks, P. I’m quite fond of crab. I was surprised that they said it was a soft-shell crab; they look different round these here parts. I tell you, I’m very fond of the meat from the Dungeoness Crab. You’re very lucky to be where you can readily attain it, and C. is lucky that he can get these mud crabs! I should like to try one…..
Looks good and like you left stuffed lol. I would enjoy a meal there. Singapore! I love Singapore, and have been to Orchard Street. Man!!! I am left really hungry now..
My company just bought a business with an office in Singapore. I renewed my passport and made it clear I volunteer for any trips over there. I configured some of the computer equipment for the office and this week one of the gals from over there is visiting here at HQ. Hopefully I can make it there. This was too much for my taste buds. Great food pics. I never made it to Singapore when I was on that side of the globe, but it’s definitely on my list of places to go if I make a return visit (and Thailand too, of course). Looks like you had a wonderful meal! Great food and even greater company makes for the best evenings. I had famous crabs or something from a harbor in DC (or was it baltimore?) with Senlin a while back. Good seasoning but goshdarn difficult to eat. hahaha I like the last pic. Your expression is funny!! XD The food looks delicious! 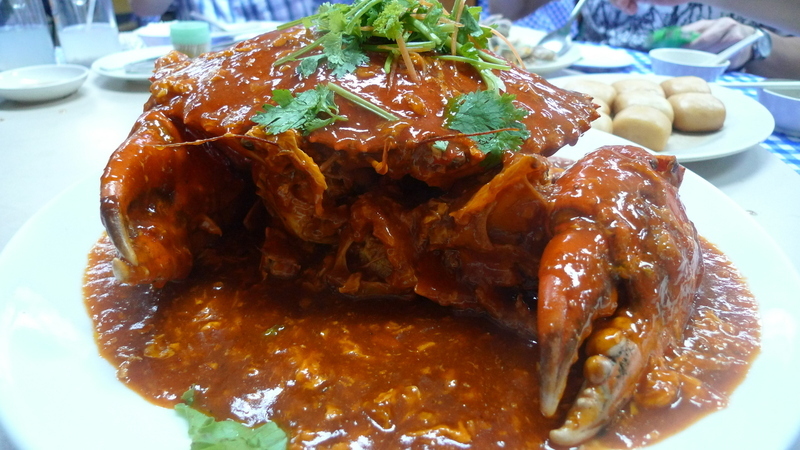 *drool* I have to taste real sg crab! Oh Singapore food 😀 And wow I used to stay in Tiong Bahru a lot during my previous visits cos a friend of mine lives in one of the apartment buildings there. 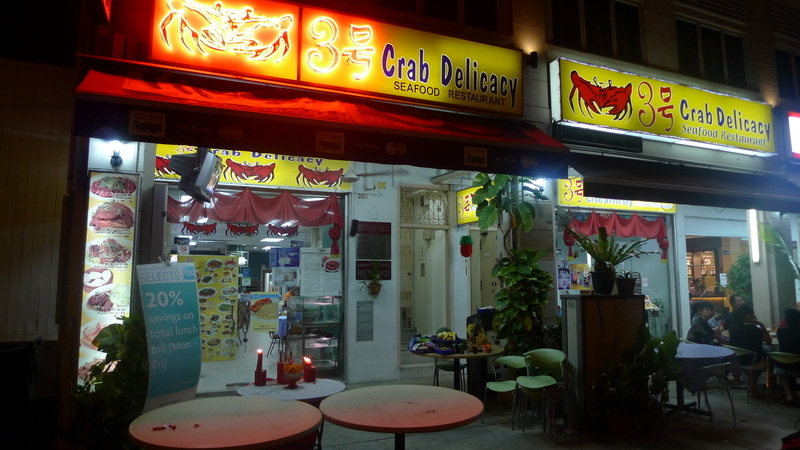 Is the crab place near the bus stop fronting Tiong Bahru plaza? Number Three Crab is a name I like. Our fav spot to eat is out at the ocean by the docks called “One Eyed Crab”. All of the food looks so yummy to me except for the crock toes. I am just not that brave. Have you ever tasted them? @agmhkg – Really? I thought it was universally loved by all Chinese! 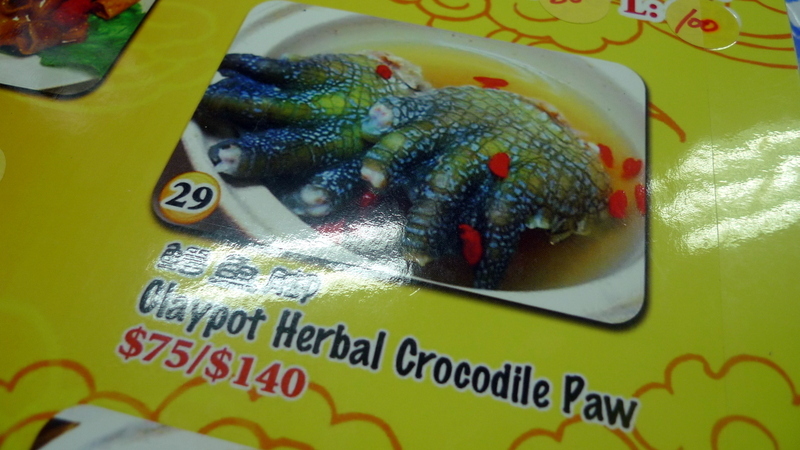 =P@Grannys_Place – I’ve heard that crocodile tastes like chicken… not sure if that is true, though. Ha ha! @oxyGENE_08 – That’s correct… you win the prize! @Got_Takoyaki – Glad you liked the expression in the picture. I have to goof around from time to time. @ElusiveWords – Oh, gosh, no! Of course it was a larger group. I just didn’t get a good picture of us. @secade – Baltimore has excellent crabs. Agreed that they can be a lot of work to eat, though. @mizz_chan – Well, I hope you do make it to Thailand one of these days. We’ll actually be in HKG over new year’s but I guess it is too late as you’ve left already! @ZSA_MD – Glad you (over) enjoyed, Dr. Z. @Ricardo98 – Got to work all the angles, right? Have the passport ready, hint and drop reminders again and again, and eventually they will send you. @angys_coco – It is a fun city to visit, isn’t it? @Fatcat723 – One thing I will say about eating crab is that since you have to work so hard to pull the meat out, it slows you down so you can’t just stuff your face until you are past the point of being sated. @murisopsis – Maybe we build a Singapore side trip into Thailand. @Randy7777 – Glad you enjoyed the pics Randy. @whyzat – So the question is, did this entry end up changing your dinner plans? @beowulf222 – Will add that to the list for the next visit. @Kellsbella – Craving seafood at 7am? Crabcakes benedict, of course! @PPhilip – Thanks for answering the question.